King's attorney Arthur Williams Jr. said Friday that King told him he wanted his funeral to be held in a church in Indianola, Mississippi, near the site where he worked picking cotton as a boy. Arrangements were not complete. King's eldest surviving daughter, Shirley King of Oak Park, Illinois, said she was upset that she didn't have a chance to see her father before he died. King continued to perform well into his 80s even though the 15-time Grammy winner had diabetes. He had been in declining health during the past year and collapsed during a concert in Chicago last October, later blaming dehydration and exhaustion. He had been in hospice care at his Las Vegas home. For most of his career spanning nearly 70 years, Riley B. King was not only the undisputed king of the blues but a mentor to scores of guitarists, including Eric Clapton, Otis Rush, Buddy Guy, Jimi Hendrix, John Mayall and Keith Richards. King recorded more than 50 albums and toured the world, often performing 250 or more concerts a year. Still, the delta's influence was undeniable. King began picking cotton on tenant farms around Indianola before he was a teenager, being paid as little as 35 cents for every 100 pounds. He was still working off sharecropping debts after he got out of the Army during World War II. King got his start in radio with a gospel quartet in Mississippi and soon moved to Memphis, Tennessee, where a job as a disc jockey at WDIA gave him access to a wide range of recordings. He studied the great blues and jazz guitarists, including Django Reinhardt and T-Bone Walker, and played live music a few minutes each day as the "Beale Street Blues Boy," later shortened to B.B. Through his broadcasts and live performances, he quickly built a following in the black community and recorded his first R&B hit, "Three O'Clock Blues," in 1951. Associated Press writers John Rogers and Mesfin Fekadu in Los Angeles contributed to this report. INDIANOLA, Miss. (AP) — Blues legend B.B. King grew up as poor as could be, alone and in debt at 14, living in primitive cabins and sharecropping cotton in Mississippi. His natural talent with a guitar enabled him to escape grueling poverty and manual labor. He became a millionaire, and played for presidents, the pope and the Queen of England. But glittering wealth and international fame never kept him from his roots in the Delta, and friends say he showed no bitterness about his rough start. King died at 89 Thursday at his home in Las Vegas, but his impact is still deeply felt in small towns along the Mississippi Blues Trail, where he came of age before the industrialization of agriculture and other factors prompted the descendants of slaves to migrate in huge numbers out of the Deep South. "I think he never considered himself as having left," author Charles Sawyer, who wrote "The Arrival of B.B. King" in 1980, explained Friday. "And he was very conscious about how he presented himself to the world, and he didn't want to present himself as an angry man." The future King of the Blues was born as Riley B. King in 1925 to sharecropper parents in a long-gone cabin along a creek in Belclair, a community near the tiny town of Itta Bena. His parents soon split, his mother died young and his grandmother then died as well, leaving him to raise and pick an acre of cotton by himself in the even smaller town of Kilmichael. King's pay — $2.50 a month, or about $42 in today's money — never matched the 8 percent interest that was typically added to sharecroppers' debts every three months, Sawyer said. Luckily for the teenager, a federal agricultural subsidy canceled his first debt, freeing him to join a cousin in Indianola, the town where he first gained attention singing gospel on a street corner as a 17-year-old. In 1980, King literally left his handprints in the cement on that corner — it's one of many spots identified with historical markers as part of the Mississippi Blues Trail. One spot not on the Blues Trail is the plantation near Indianola where King suddenly found himself in debt a second time, in his early 20s, prompting him to flee to Memphis, Tennessee, and give up gospel for the blues. A tractor King had parked lurched forward, breaking off its exhaust stack. Fearing retribution, King fled the plantation, wrote a farewell note to his first wife, grabbed his guitar and hitched a ride on a produce truck for the big city, where he realized music could make him money. King then decided to return to Indianola, work off the cost of the tractor repair and leave for Memphis for good with a clean slate, Sawyer said. A lot of entertainers "denied where they're from because they were ashamed of it," said a longtime King friend, Carver Randle, whose Indianola law office has a mural-sized, black-and-white photo of the young bluesman on an outside wall. "B.B. has never been ashamed to say he was from Indianola, and he claims Indianola as his home," Randle said. "So, that stands out in my mind, in letting me know the humility of the man." Indianola still has just 10,300 people, but for more than three decades, it's where King hosted the B.B. King Homecoming, a summer music festival that brought big crowds to town. His life story is told at the B.B. King Museum and Delta Interpretive Center that opened in 2008 in Indianola, attracting visitors from around the world who seek an authentic American roots music experience. But at King's insistence, the small museum has become a community center, hosting music camps for children, offering docent jobs to young adults, and sponsoring seminars on such topics as controlling diabetes, a disease King had for years. "He's the only man I know, of his talent level, whose talent is exceeded by his humility," said museum board member Allan Hammons last week. King's influence was evident as elementary school students spent their afternoons exercising, learning about nutrition and taking music and art classes. Teachers from nearby Delta State University showed one group how to play a rudimentary blues song on electric guitars, adding their own improvised lyrics. Education coordinator April Brock showed off portraits other children painted during Black History Month, of Rosa Parks, Michelle Obama and B.B. King. King's legacy also can be found in a recording studio named in his honor at historically black Mississippi Valley State University in Itta Bena, and in the blues archive at the University of Mississippi in Oxford, where King donated about 8,000 of his recordings — mostly 33, 45 and 78 rpm records, but also some Edison wax cylinders. Archive curator Greg Johnson said some of the recordings were of King himself, but many were of other artists King admired, including the Belgian-born guitarist Django Reinhardt. The collection also includes about 50 foreign language courses from which King learned phrases to use on stage during international tours. "The sheer number of people who have been influenced by him is pretty staggering," Johnson said. "Also, just his generosity — that sort of transcends everything." King kept up a grueling schedule, performing 100 nights a year well into his 80s, nearly 18,000 concerts in 90 countries during his lifetime, Sawyer said. He did it partly because aside from "The Thrill is Gone," King lacked the kind of big hits that brought in huge royalties. But he also felt responsible for the livelihood of all the people who put his concerts together, and because he simply loved connecting with audiences, Sawyer said. And whenever he could, he came back to Mississippi, where he had many friends and admirers, said Dorothy Moore, a Mississippi singer who had a hit in 1976 with the blues classic "Misty Blue." Moore grew up listening to B.B. King records at home, and later performed at concerts with him. "He has paved the way for me and other artists," she said. King also frequently performed at the annual Medgar Evers Homecoming, a Jackson-area celebration that honors the memory of the Mississippi NAACP leader assassinated in 1963. On Feb. 15, 2005, the Mississippi Legislature honored King with resolutions commending his long career and he received a standing ovation in the Senate chamber. The singer pulled a white handkerchief from his pocket and wiped away tears. "I never learned to talk very well without Lucille," King said that day, speaking of his black Gibson guitar. "But today, I'm trying to say only God knows how I feel. I am so happy. Thank you." Associated Press writers Michael Warren in Atlanta and Stacey Plaisance in Indianola contributed to this report. LAS VEGAS (AP) — B.B. King's physician and the coroner in Las Vegas say the 89-year-old blues legend died of a series of small strokes attributable to his longstanding battle with type 2 diabetes. Dr. Darin Brimhall and Clark County Coroner John Fudenberg (FYOU'-den-berg) tell The Associated Press the medical term for the cause of death is multi-infarct dementia. It's sometimes referred to as MID, and is also called vascular dementia. Brimhall says King's strokes resulted from reduced blood flow as a consequence of chronic diabetes — or unhealthy fluctuations in blood sugar levels. "The fact that Beale Street Blues Boy is the origin of Riley King's nickname is the type of authentic connection that will never die. We have our own Memphis Music Hall of Fame because this city has been foundational in the careers of icons like Elvis Presley, Al Green, Johnny Cash and Isaac Hayes, to name a few. It is altogether fitting that we will mark the life of B. B. King on Beale Street this weekend." — Memphis Mayor A C Wharton Jr.
LAS VEGAS (AP) — Five of B.B. King's adult children visited the blues great one last time in private Thursday at a Las Vegas funeral home that will host a public viewing Friday ahead of a Saturday memorial service. They said the King of the Blues was dressed in a signature purple and gold brocade jacket with black lapels. It wasn't one of his most ornate. But some among the group — daughters Karen Williams, Patty King, Rita Washington and Barbara King Winfree, and son Willie King — told The Associated Press they didn't think their father looked like himself. Williams and Patty King accused King's longtime business agent, LaVerne Toney, of keeping them from seeing their father for a week after he died May 14 at home at age 89 — and of preventing them from taking photos of him in his casket. "A picture paints 1,000 words," Patty King said as she showed cellphone images of the same family group with their father at his birthday in September. "He loved his children." The five family members refer to themselves as a family board. B.B. King is survived by eleven of his 15 children. Toney, who worked for King for 39 years, has retained power-of-attorney over his affairs and estate despite several court challenges by Williams and Patty King. Toney told AP she's doing what B.B. King said he wanted. "They want to do what they want to do, which is take over, I guess," Toney said of the family group. "But that wasn't Mr. King's wishes. Mr. King would be appalled." B.B. King's will, dated Jan. 18, 2007, and filed Wednesday under his birth name, Riley B. King, appoints Toney as sole executor of his affairs. Another daughter, Riletta Williams, was second in line, but she died last September. Toney is banning the media and photographs of any kind during the public viewing from 3 to 7 p.m. at the Palm Mortuary on South Jones Boulevard. Funeral director Matt Phillips said viewers will be able to file past the open casket and security officials will prevent photos. The media won't be allowed inside. King's eldest daughter, Shirley King, who isn't part of the group, has booked a Las Vegas Strip venue for what she said will be a free musical tribute event starting an hour after the public viewing ends. "I don't want to be part of the argument over his life," said Shirley King, who lives in Chicago and performs as Daughter of the Blues. She booked a room at the Brooklyn Bowl Las Vegas at the Linq promenade to open at 8 p.m. Friday for what she said will be live music and remembrances. "I don't want to fight with family. I don't want to fight with management," she said. "When everybody gets through being sad about him leaving, I want them to come out and let the good times roll and be happy about his life." Saturday's 11 a.m. memorial service at a Palm Mortuary chapel near downtown Las Vegas was announced as a gathering for family and friends only, but Toney said she doesn't know who will attend. Plans then call for a Wednesday procession with his body down Beale Street in Memphis, Tennessee, and a Handy Park tribute. After that, King's body will be driven to Mississippi for another ceremony and burial May 29 at the B.B. King Museum and Delta Interpretive Center in Indianola. JACKSON, Mississippi (AP) — Hundreds of music fans are expected to let the good times roll Sunday at the 35th annual B.B. King Homecoming Festival, a free gathering that the legendary bluesman started in his hometown of Indianola, Mississippi. Performers this year include a country blues band called the North Mississippi Allstars; a Bentonia, Mississippi, blues guitarist and singer, Jimmy "Duck" Holmes; and a children's choir based at the B.B. King Museum and Delta Interpretive Center in Indianola. King played at the free festival dozens of times. 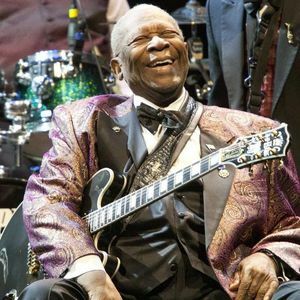 He drew a larger than usual crowd in 2014, which was already billed as the final homecoming performance for the King of the Blues, who was 88 at the time. While King was still alive, organizers were planning this year's event as a tribute to him. Since his death on May 14, they are calling it a memorial celebration. The festival is held on the grounds of the museum that opened in 2008. "We certainly will miss his infectious smile and warmth this year, but we have no doubt he would want us to carry on with this tradition," the museum's executive director, Dion Brown, said in a statement about the festival. Scott Barretta is a researcher and writer for the Mississippi Blues Trail and helped establish the B.B. King Museum and Delta Interpretive Center. He also attended the B.B. King Homecoming Festival many times. He said the outdoor shows were typically much more casual than King's concerts that were played in larger, fancier venues. During the homecoming shows, King would invite local children onstage to sing and dance. "When B.B. would come back, he was always so free with his time," Barretta said in an interview Friday. "He may have had handlers, but they didn't stop him from shaking hands with everyone or talking to everyone. It really was a homecoming." After the homecoming performance in the early evening, the hottest ticket in Indianola was to see King perform after midnight in Club Ebony, an Indianola night spot that had been a hub of the blues since the late 1940s. King also performed free for many years at the Medgar Evers Homecoming Festival that started in central Mississippi in 1973 to honor the memory of the leader of the Mississippi chapter of the NAACP civil rights organization who was assassinated in Jackson in 1963. King was friends for decades with Medgar Evers' brother, Charles Evers. Barretta said King probably could have made hundreds of thousands of dollars touring in other places during the weeks he played free concerts, "but instead he gave back to Mississippi." King was 89 when he died at his home in Las Vegas. Fans lined up for a public viewing of his body in Las Vegas on Friday, and a private memorial service was being held in the city Saturday. His body is being flown back to Memphis, Tennessee, on Wednesday, and a tribute is scheduled that day at W.C. Handy Park on Beale Street. A public viewing is scheduled for Friday at the museum that bears his name in Indianola, with a funeral Saturday at nearby Bell Grove Missionary Baptist Church. He will be buried during a private service on the museum grounds. JACKSON, Miss. (AP) — Friends and fans are getting a chance to file past B.B. King's coffin during a public viewing Friday in the Mississippi Delta, the land that gave birth to the blues. The visitation comes a day before the funeral for the man who influenced generations of singers and guitarists. King was 89 when he died May 14 at his home in Las Vegas. A public viewing and invitation-only memorial service were held in that city before his body was flown to Memphis, Tennessee, for a tribute Wednesday. Hundreds of people lined the roads to catch a glimpse of the hearse that drove his coffin from Memphis to his hometown of Indianola, Mississippi. He will be buried on the grounds of the B.B. King Museum and Delta Interpretive Center in Indianola. INDIANOLA, Miss. (AP) — Blues pioneer B.B. King is being remembered in the Mississippi Delta as a man whose talent was equaled by his generous spirit. King's funeral is Saturday in Indianola — the small town where he first gained attention as a young singer and guitarist who had already been a sharecropper and worked in a cotton gin. King was 89 when he died May 14 at his home in Las Vegas. More than 4,000 people viewed his open casket Friday at the B.B. King Museum and Delta Interpretive Center in Indianola. One of his sons, Willie King of Chicago, said his father taught him to respond with love when others are angry. "For a man coming out of the cotton field unlearned and you take his music and draw four corners of the world together — that is amazing," Willie King said Friday at the museum, where his father will be buried. King's public viewing Friday was almost like a state funeral, with Mississippi Highway Patrol officers in dress uniform standing at each end of the casket. Two of his black electric guitars — each named Lucille — stood among sprays of flowers. Blues guitarist Buddy Guy, 78, said he always intended to tour the B.B. King Museum while its namesake, his longtime friend, was still living. "His left hand was a special effect," Guy said, describing King's talent for bending strings to make the guitar sing. "These young people playing, you punch a button and you get a vibration," Guy said. "He didn't need that. He invented that." Mike Doster of Nashville played bass in King's band for 17 years and said King nicknamed him "Mighty Mike." "He was very demanding but very fair," Doster said Friday as he waited for King's casket to be wheeled out of the museum after the public viewing in Indianola. A public viewing and invitation-only memorial service were held in Las Vegas before King's body was flown to Memphis, Tennessee, for a tribute Wednesday.